It’s hard to believe, but the Pixies have been around as a reunion act for almost as long as their original incarnation. 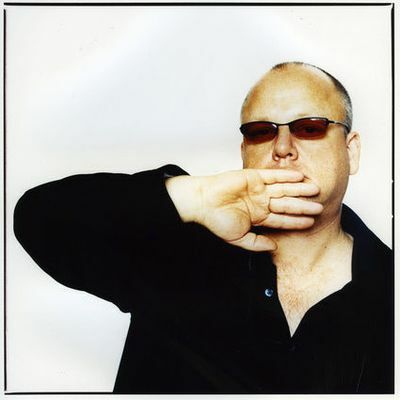 When Frank Black (aka Black Francis) announced his new project shortly after the Pixies’ first triumphant reunion tour, few could have predicted where he would end up. The self-taught, idiosyncratic king of indie rock was working in Nashville, Tenn., with seasoned session musicians. The impulse yielded two albums, 2005’s “Honeycomb” and 2006’s double album “Fast Man Raider Man.” Earlier this year Black announced a third Music City installment was on the horizon. It’s also a road well traveled. In 1966, Bob Dylan left New York City to record at the CBS studios in Nashville with the day’s top session players. More recently, Robert Plant ventured to middle Tennessee to work with Allison Krauss and Buddy Miller. Black’s collaborators are a world removed from the Boston underground scene where the Pixies formed in the mid-’80s. His album credits today include Muscle Shoals legends Dan Penn and Spooner Oldham, Stax guitarist Steve Cropper and drummer Chester Thompson, pal of Genesis and Frank Zappa. During sessions in Los Angeles, Black worked with Funk Brother Bob Babbitt, Al Kooper, Phil Spector veteran Carol Kaye and drummer Jim Keltner. Grab any of your favorite major-label albums from the late ’50s to the mid-1970s and at least one of these names will be found on the sleeve. When Black comes to town on Monday, he’ll be without any of his all-star assistants. In fact, Black’s only company onstage will be his acoustic guitar. But regardless of his surroundings, Black said, his goal is the same: to satisfy the customers. “That’s where I’m at now and it’s no different from when I played my first gig,” Black said. It seems hard to believe in wake of the deification of St. John and the myth building of Sir Paul, but George Harrison was far and away the most successful of the solo Beatles after the implosion of the group. The “Silent Beatle” racked up three No. 1 hits, a blockbuster triple-album, lured the reclusive Bob Dylan to appear at his all-star charity concert alongside Eric Clapton and fellow Beatle Ringo Starr, scored big with the subsequent Concert for Bangladesh soundtrack album. Harrison rang in 1975 with “Ding Dong, Ding Dong,” the second single from his third solo album and the opening cut on its second side. A gentle kiss-off to his former band and bright look ahead, Harrison’s laid-back, hopeful approach – “ring out the old, ring in the new; ring out the false, ring in the true” – supported his optimistic spirituality. The catchy number is pretty simple, essentially four choruses and a bridge bolstered by a short, two-stanza verse. The arrangement hangs on Harrison’s slide guitar riff and is punctuated by a horn section. The galloping drums recall Phil Spector’s production on the previous two Harrison albums. The presence of keyboard player Gary Wright, bassist Klaus Voorman and Starr suggest the basic track may have been laid down during 1973’s “Living in the Material World” sessions. The three musicians aren’t credited anywhere else on the “Dark Horse” album. Guitarists Ronnie Woods, Mick Jones, in pre-Foreigner guise, and Albert Lee also appear in Harrison’s Wall of Sound. While the song’s roots stretch back, the vocals are unmistakably new. Harrison developed laryngitis while recording the album, and because of a pending U.S. tour – the first-ever American tour by a Beatle since the group’s final show in 1966 – he could not wait for his throat to heal. The resulting vocals were raspy and strained and Harrison’s voice was completely shot when the tour kicked off. 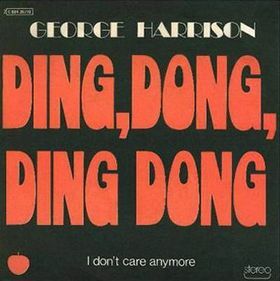 “Ding Dong, Ding Dong” was Harrison’s lowest-charting single to date, but it still cracked the Top 40. For some reason, Harrison didn’t perform it during the North American tour. The trek was one of the first major arena tours, and performers will still figuring out how to translate the nuances of their songwriting to large sports domes. Critics savaged Harrison’s hoarse voice and bombastic band arrangements and silenced Harrison’s ambition as a live act. The failure of Harrison’s 1974 U.S. Tour ended his reign as Top Beatle. The following year McCartney launched a massively successful tour immortalized on the “Wings Over America” LP and Lennon grabbed headlines with his Lost Weekend escapades. Harrison returned to his familiar post, turning out reliable, if largely unchallenging, albums and guesting on songs with friends. Once again, he was the most celebrated second fiddle in pop music. “Ring out the old, ring in the new” indeed. 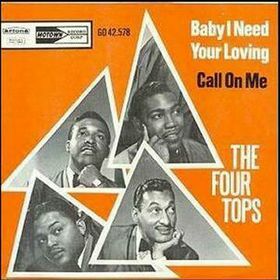 Few had heard of the Four Tops before this song was released in the summer of 1964, but the public quickly became acquainted. The quartet’s debut single sold over a million copies – a feat equally impressive in today’s iTunes era – and landed just outside the Top 10. Songwriters and producers Holland-Dozier-Holland went the Phil Spector route in the studio, hauling in a 40-piece string section and supplementing the Four Tops’ voices with backing vocals from the Andantes, a female trio also signed to Motown. Spector’s Wall of Sound productions were simultaneously big and small. For all the attention lavished on the strings and vocals, check out the echo on those finger snaps. That’s ultimate flattery for Spector. Levi Stubbs’ lead vocals capture the ache and longing of a lover hoping to be forgiven. The way he sings the line “lately I’ve been losing sleep” perfectly captures a midnight soul search in a bed too big.